If we took this passage literally, we would always find it so easy in the interpretation that only the one who knows the bottoms of hell can love God more than another. It is in fact only the attitude of heart to recognize oneself completely lost as long as our references are from the carnal nature. Wherever from we came, we all come from the depths of hell. Whether we are born of a Christian family or a dive since generations in the occultism, as long as God has not rewritten our soul, we are all doomed to perdition. The carnal dimension received psychologically may be different according to the provenance, but whether it is very similar or opposed to the dimension of the Spirit of God, it remains written in our soul from data that will produce an error subject to the guardianship of Satan. This error will not necessarily be perceptible to men, but to God without a doubt. That is why repentance and the calling into question of the Holy Spirit are identically important to the one who will appear humanly balanced and wise, than to the one considered full of nonsense and unstable. It is great to be able to lead a long and good existence in the presence of God, and to rest his life, his couple, his family, on the blessing of God, but it must be clear however, it is not always the one who seems most apt to speak of the holiness of God who is the most irreproachable in his heart. Many are those whose hearts are more or less hardened, which speak according to a great knowledge of the Scriptures, often demonstrating their knowledge by numerous biblical quotes. These often argue eloquently that they are great men to whom everyone can trust, having known God from their earliest years, and being sometimes since many generations in the service of God. The glory of God rests on the one who loves Him in obedience to his precepts, and seeks to follow Him, whatever it costs to him. He who would have preferred the synagogue to God, may have remained surrounded by a large number of listeners throughout his life on Earth, in the critique of the poor unfortunates lost from outside, but sometimes will have himself lost his soul for eternity by the condemnation that he made so rest upon others. It is indeed easier to use the Word of God to justify a carnal dimension to which we were able to be subjected since our earliest age, than to actually live it in the depths of our hearts without religious legalism or fundamentalism. The dimension of God's love in us, is actually occurred by a practice of faith and not through an apprenticeship of the good rules of God's law, according to the interpretation that some can make of it, to which we have given reason. That's why we're going to continue to talk about my experiences, not rules drawn from a religious comparison, such as doctor of divine law could do. After a personal investment on our part in the Biblical learning of the word of God, dispensed according to the major Christian denominations, we found ourselves Marie-Claude and I, somewhat aloof from the main religious currents. We could say today that this remoteness had been prepared in advance by God, in order to make us live individually and without preconceived external idea, the image of a personal psychotherapy guided by the Holy Spirit of God. This therapy had begun with certain personal understandings and revelations from the very beginning of our conversion, but then very awkwardly managed in the fire of our first love towards God. We could therefore situate the real beginning of the work of reconstruction a few years after our conversion, towards the beginning of the year 1991. We had sincerely entered into a personal investment of every moment with God since our encounter with Him, and had already received a biblical formation of calling to the ministry of God at that time. It seemed to us then, that nothing could stop us from serving God full-time in a traditional priesthood of teaching the word of God, attached to our assembly. It was then without counting on God Himself who wanted to bring us His personal touch in a daily search for communion with His Spirit. This is how a few years later, early 1995, when the Lord was going to lead us from Normandy to Provence, I was convinced to have to put black on white all the process engaged, of which we could already see a great benefit in us, and more particularly in me. This work was to be called the Boomerang effect, but over the months the understanding was given to us, that it would not be published in a first time. So it was at that time only a personal work that would not be publicly seen. One or two attempts at editions confirmed it to us. Now eight years ago, and what I wrote for myself, I see today the daily benefit in my own life and that of those around me. It is not, however, a new doctrine, new guidelines of lives with new rules, but rather an exhortation for everyone to turn to a living God, filled with Love for all of us. He knows how to make us live miraculously, the daily miracle of the new birth in the depths of our heart, for a practice of his law and his love in our daily labor. Our remoteness from certain Christian circles allowed God to protect us from putting into practice precepts to which we could have given carnal reason. Numerous are those who so act without realizing, that they then fall into a form of religious blindness in all things, in favor of those who have spiritually educated them. In this opposite, the Lord led us regularly to fight against the principalities and dominions in the celestial places that had carnally enslaved our souls in the past, in order for us to discover after the victory, reactions on our part giving not only reason to his Spirit, but also to his law and his love, since this goes hand in hand. It goes without saying that my words should not be interpreted as the result of a hundred percent accomplishment for ourselves, but as a path that we recognize as good. This would mean, otherwise, that we have already arrived at the perfect stature of Christ, a thing in which we must not fall into the trap for anyone, at the risk of falling into idolatry. The various subjects that we will be going through together, during these few pages, therefore only commit my own responsibility to God, not the responsibility of those who would have could bring to me any teaching whatsoever. It is for this reason that I will no longer quote our experiences of life with their context and the people who refer to it, but our experiences of faith, which brought a real liberation of our soul, opening doors to the practice implementation of the word of God. My goal in this book, however, is not to demonstrate to you the miracle of baptism in the Holy Spirit that anyone can live personally. This "miracle," for it is indeed a miraculous and divine spiritual work, happens to be a confirmation, as an approval of God in front of the repentance of the person herself. Because of various reasons, this "miracle" goes unnoticed by some who then feel like unwanted of God. It is sometimes only a small part of themselves that they unwittingly do not want to give to God, or the opposite, for having lived there for a long time without really paying attention to it for want of knowledge. This miracle happens to be the phenomenon of interlocking toward a new birth of which Jesus spoke to Nicodemus (John 3-1/8): There was a man of the Pharisees, named Nicodemus, a ruler of the Jews: The same came to Jesus by night, and said unto him, Rabbi, we know that thou art a teacher come from God: for no man can do these miracles that thou doest, except God be with him. Jesus answered and said unto him, Verily, verily, I say unto thee, Except a man be born again, he cannot see the kingdom of God. Baptism in the Holy Spirit, therefore, is an understood and evident fact that no one can deny, even though it is sometimes disputed by some teachers of the word of God in Jesus Christ, who have themselves not yet lived it. I will not accordingly return directly to this subject, but if, nevertheless, you would doubt of this spiritual reality, every Catholic or Protestant Christian ecclesiastic, to cite only the principal orders, would easily cans to explain it to you and demonstrate it as being in accordance with the word of God. Some congregations consider it true only on the servants themselves and not on the whole of the subjects, but this does not change anything for the demonstration of the existence of this spiritual phenomenon. Without entering into a theological conflict, but for having experienced the manifestation of it while I did not know its existence, we shall therefore retain only these few words of (Hebrews 6-1/2): Wherefore, leaving the word of the beginning of the Christ, let us go on [to what belongs] to full growth, not laying again a foundation of repentance from dead works and faith in God, of [the] doctrine of washings, and of imposition of hands, and of resurrection of [the] dead, and of eternal judgment;// The author of this text, usually attributed to the Apostle Peter, speaks here of baptisms, first of repentance, called Baptism of water or of John the Baptist, of that of the spirit that Jesus gave to Pentecost, as comforter and Spirit of truth promised, and finally the baptism of fire which is that of sanctification. He who has placed all his trust and given his whole life to Jesus Christ is a priest, that is to say, servants of God, whether he be lay or ecclesiastic in his daily labor. We will therefore endeavor to see together the various possibilities of employment in our own lives, the revelations that the person of the Holy Spirit brings to us personally. Indeed, even if what the Holy Spirit tells us is very frequently revealing of our own sin in order to make us victorious, the one who receives the information will be subjected to the difficulty of putting into practice according to God in his own life. It is thus that the same sin committed by different people and revealed by the Holy Spirit to each of them in order to make them advance in the purification and liberation of their souls, can be managed in different ways, depending on the attitude of everyone's heart, but also and mainly according to their received teachings. This will obviously not produce the same result, and some will have much greater difficulty than others to enter into the spirit and truth in the obedience of the word of God through the faith that the Holy Ghost breathed into them. They will then remain only in the carnal dimension of their soul which will have given reason to the Word of God, but they will not have received from God Himself, the transformation allowing them to live this word with a true and sincere heart. God is Love and wants to make us all conquerors of sin to bring us progressively to the dimension of the "mature" man, to the perfect stature of Christ. This is the purpose of God, when he has "seeding" us with the Holy Spirit. If we accept to let ourselves be cultivated correctly, this seed produces in us a fertilization from which a new being emerges. This latter is then encouraged to advance in sanctification by victories over his own previous reactions, which did not conform to the word of God, which had hitherto limited him without he necessarily realizes it. "Before a woman gives birth to a child, he must have been begotten." Before then, that a person give birth to a human being according to God, he must have been begotten. It is, for my part, the impression that I have of my baptism in the Holy Spirit as to my "new birth". As I wrote these lines, it had been nearly seven years since I had been begotten by this new seed of the Holy Spirit, but between these two periods I myself had felt as if I had remained In the womb of my mother, waiting for the time of the pains of childbirth. I had certainly not remained in the idleness of a fetus, but in the expectation that God form to me my hands to write, my mouth to speak, my legs to run. By this, I mean that when I was baptized with the Holy Spirit, I received life, the seed of truth, but full stop. I thought I was already a child, I thought I was already an adult, but just like Job, I had only heard of God. I had obviously experienced the fertilization of this new birth, and in this I had already discovered a multitude of marvelous things. I had at the same time received an inexhaustible thirst for the Word of God, the profound desire to educate me of it, that same desire to serve Him, but had I been completely transformed, body, soul and spirit? I do not speak here of what some interpret this word solely in the multiplying sense of their nature, consider that they must gains followers in order to please God, while we always speak for our part of the fruits of the spirit described in Galatians 5 -22. So I had become a seeded land, I was called a being born again according to God, but would this new birth really take root in me, at the most deep in my soul and mind? Let's just say I was germinating. I was a little like a building whose renovation decision was taken and for which the base stone was straightened and reinstalled on a solid foundation. Between this moment and that of the inauguration of the edifice, a whole program established by God was going to lead me through a path, that of my life, which would lead me into this new birth, this progressive renewal of my soul. I still do not dispute the teaching that does correlate the new birth to the baptism in the Holy Spirit, for I think that to the extent that the first stone is laid, God sees the edifice as complete. However, we still have to agree to "deconstruct" the old construction, so that the Lord of our Lives reconstructs it as a building according to him. This one will not be finished or will reach its highest level, only when God will take us back to him. If we allow ourselves to be properly guided by the Holy Spirit, he is not the one who will break our hearts, our feelings into a thousand pieces to make a sort of pell-mell and reconstruct our psychology according to a pyramid built up upside down. On the contrary, he will carefully withdraw each stone from the old construction and replace it with two stones in the edifice under construction. One of them will continue to look like us, for God does not want to make us stereotypical robots, as for the other, it will simply be a small part of Himself, of His Grace, of His Love, which we then discover as a precious and wonderful stone. We will often marvel at this one, surprised to discover so many benefits in our lives. This is already The Boomerang Effect of God that we will thus discover from day to day, from sanctification to sanctification, from Grace to Grace, step by step on the path of our life. This life which we believe to direct ourselves, in view of our carnal presumptions, is none other than this pyramid built more or less in reverse, which collapses so easily through the vicissitudes of life when the limits of our feelings are exceeded. This is so, because our soul has been constructed by parallel of images acquired in our childhood, on which the rest of our experiences are based. The precarious balance of this edifice brings to the one who lives it, only an appearance of stability as long as the lived dimension remains in a known dimension of itself, allowing it, the survival of its body. This logic is actually born in the selfish needs of animal survival of the body, and we will come back to it. This one was not, however, constructed alone, but through spirits attached to that logic and related to it, which we will talk about later. There is no real love in it, but a selfishness grateful to the one who accepts us as "we are", and thereby even, a carnal love attached to ourselves or what we consider belong. This belonging extends it very well on the group of individuals considered by us to be necessary for our survival or for which we consider ourselves responsible. That is why our love is limited and does not allow us to reach the dimension announced by Jesus, to be able to love our enemies as ourselves. Because we prefer to fight against men and often even our brethren in Christ who do not quite resemble us, rather than strive to fight against the dominions in the heavenly places which prevent us from loving them despite their differences. We often prefer to throw the others into Satan's arms, rather than use wisely the weapons that God gives us for our-selves. We are surprised then that God does not follow us in our ways, giving reason to our enemies who may denigrate him or to the opposite who seek him in the same way as we do. We are easily mistaken of enemies, and it is for this reason that we hear so often from those who are disillusioned the behavior of the people only religious: "If god existed ..."
At the time of my first writings, just before I approached this subject, while I was praying, the Lord gave me a very simple vision: A large pebble in the shape of Camembert was gradually surrounded by earth forming an inclined plane to its entire circumference. At the same time I received part of the meaning and described it to Marie-Claude who was at my side. This stone was the sin on a path, and this inclined plane which gradually formed was the land of the path brought back around the pebble, by the work that every Christian does, when he acts humanely. He uses the part of life that he withdraws in order to be able to pass over "his" sin on the way of his life, and not to strike it of the foot, at the risk of stumble. As I was talking I had the impression that it was the work of a hoe and at the same time the work of the Holy Spirit. I then said, "Forgive me, Lord, to compare you to a hoe, but the Lord will enlighten me." The hoe was not itself the Holy Spirit, but the tool used by the worker, himself taught by the Holy Spirit. I suppose everyone knows this tool provided with a metal plate almost vertical, equipped with a handle of average length that is a gardener's hoe. If it is used according to its initial design, this tool serves two main functions: one to cut the weeds that would invade the crops, the other to aerate the soil superficially, thus avoiding the evaporation of water by breaking the capillarity of the superficial layers of the soil. An ancient proverb thus gives a good method of gardening: "A hoeing is worth two watering". It is the same with our lives. There is no use to water it and water it again, neither with the Holy Spirit nor the word of God, if we do not want to cut the roots of our sin and aerate the soil of our life, but the subject is not really there. This form of using that the Lord had given me, to bring the earth surrounding a large pebble to surround it, might not have been too barbaric in the ground rather supple of a garden or a field, since the hoe also can be used to earth vegetables, such as potatoes. On the other hand, it would have been a low-recommended job for the tool's own lifespan, on the hard terrain of a path. The path of the Christian's life is often strewn with this kind of pebbles, coming from the depths of himself and reappearing on the surface of his life by situations in which his reactions lead him to sin. This Christian, who is then challenged by his conscience and the interpretation given to him by the Holy Spirit on his former type of behavior, can act in different ways. The one we will see first and that God showed me in this case, was certainly not the best, but perhaps the most frequent. Feeling accused by the comparison between his behavior in this situation and the image received from his consciousness analyzed by the Holy Spirit, sincerely willing don’t fall back into this kind of error, the sincere Christian who does not pause questions begins to scratch the portion of life that led him to error, but find consolation to be always with God. The life adjoining his sin, which he has retired, will serve him as an access ramp to overcome and pass over this "stone" without noticing it better than by a small opposition, a temporary nostalgia. As this person will encounter this same sin under other circumstances, she will unfortunately have to take on the corresponding share of life again and again to use it as a access ramp, until completely surrounded the sin; always more life of which she will have to go without. This Christian will have struggled in reality against flesh and blood. The flesh, because he will have fought against his own psychology for fear of being disapproved of God or men, and will have believed able himself, to overcome his own construction. He will also have struggled against the blood of Jesus who would have allowed him to feel forgiven, but also against his own for the part of life that he will have withdrawn. As long as he remains in favorable conditions to his equilibrium, he will remain in the carnal presumption of believing himself the winner of sin. In fact, he will have been purely defeated by this latter, who will have taken from him the life of abundance and joy which God wills to give to each of those who follow Him. After this fundamental error of pathway, if he skates over his way through a consciousness examination, he will often derive a glory from being passed without hitting his feet on his own sin, but will consider himself consoled by the Holy Spirit of all life lost, because he will be satisfied with his own obedience, while Satan will rub his hands and the Holy Spirit shall weep. If we apply this type of approach to the concrete example of a Christian man wanting to preserve himself from the temptation of the lust of women, a man may very well enter a monastery and live as a hermit, completely cut off from the outside world. This one will then be able to comfort himself of his sad fate, considering that sin no longer exists "in him", whereas he has only withdrawn the temptation of his sight to believe himself free from sin. It is therefore sin, which led him to become a prisoner of his four walls. We can actually easily do the same, when we accept Christ in our life by forbidding us sincerely a lot of temptress’s circumstances. We will thus remain prisoners of our limits of life and without realizing it, of our sin, since it will be this one who will have forced us to push these limits to protect us, sometimes up to these four walls. We will may believe that we are free from this sin because we will not reproduce it any more, we will can even boast about it, but if we are confronted again, we will feel more or less compelled to criticize and condemn our fellow men who are rubbing shoulders with it, rather than loving them. Furthermore, our critics will not necessarily be in agreement with the reality of our hearts, sometimes tempted by this sin. Those who act thus are obliged to impose themselves: Such circumstance entices me to sin "I" retrench everything that goes with it, a little land, of life. Such another also entices me, "I" still condemns everything that goes with this, even more land, more life and more and more, up to the four walls. They are then only rules, philosophies that do not change anything in the heart or in the soul. The great majority of these rules will probably be good, since they are generally drawn from the law of God, but they will only bring rules on rules, rules on rules, rules on rules. This will obviously create a lot of imbalances in a life that God would like to be balanced, many condemnations in a life that God would want full of love, a lot of pride in a life that God would want full of humility. Each time indeed we place ourselves at the top of the sin that we have just surmounted; we overhang and criticize all those who wallow in the mud, in the hole of life that we have just taken away from us, even if they would benefit from this life without committing sin. For example, a man can look at a woman without coveting her, what harm is there in that? The one, however, who in the presence of a woman will not be able to refrain from coveting her, will generally find a good reason to criticize first the woman, the object of her lust, but also the one who, without committing a sin of covetousness, will eventually be held in the presence of this woman. If this man thinks he has charge of souls, do not you think that he will vigorously prohibit looking at a woman to those who will follow him? This latter, however, does not know that the course of his life will reserve for him inclement weather, as is the case with everyone. These will come to ravine his work. He will then begin scratching, scratching and scratching his way again, his life, in order to better make disappear the pebble, the sin, often for fear of being discovered by his compatriots. As you have probably already understood, this has nothing to do with the work of the Holy Spirit, even though it was he who revealed the sin of covetousness to the man that we have just taken as an example. This work is none other than that of a person who is often sincere, driven by a spirit of religiosity. He hides behind a semblance of mortification, or even a total mortification to give himself airs of piety, while he may be the opposite in his heart. It is actually chasing life to stop committing sin, rather than chasing sin to inherit life. If we become aware of it fairly quickly, the work to be done will not be too important and will not have too many consequences. Unfortunately, some will never get away with it and as the Pharisees in the time of Jesus will generally go so far as to condemn their fellows men, stoning them at least verbally. May many still be reassured, for God always gives a new chance to him who has deceived himself, if he desires absolutely to remain in the truth, and humbly asks Him. Life is indeed an eternal recommencement, as many say, and every day we go back all, more or less, by the same path as the day before. The work, the encounters, the expenses, the eating, the drinking, what else do I know? Everything that makes from life our life! If we have rammed down the earth around this stone in the shape of Camembert, as we pass and pass again around, the inclined plane will sag and the stone of our sin will begin again to hang our feet. If we want to remain true before God without subterfuge, just as we could have done it the first time, then we can do it so again. God will never reproach a good attitude, and the Holy Spirit will lead us to repentance, to the forgiveness of our sin and to the liberation of that stone in our souls. If we have remained sincere before the men and before God Himself, but not wholly true according to our heart, the Lord will not reject us the day we come to him as we are in all truth. This is how he desires us, whether we have two days or twenty years of Christian life, so let's not be afraid of the truth of heart, it is better than any appearance, so small it is. 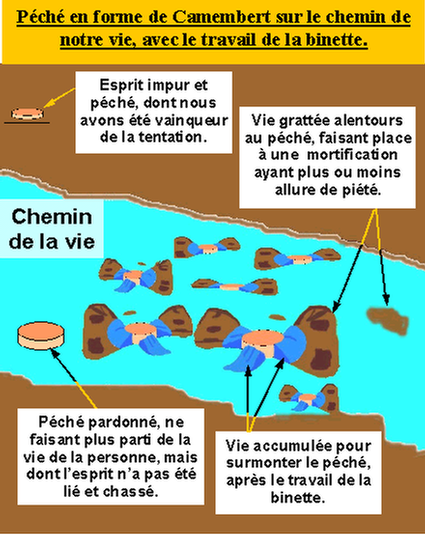 After having had this vision, another peculiarity raises questions me without any real explanation, and for several days I remained in prayer on this subject, asking God for understanding: This pebble in the form of Camembert, Was originally only laid on this path, and was not pushed in the ground. When I had the revelation, I suddenly realized that this pebble was not an integral part of the road, but that it was the harassing work of the worker that it had made integral with him. It was he who had assimilated it to himself. In the present circumstances of this sin resurrected on a path, the goal tried to find by the Holy Spirit was to make the person concerned victorious by guiding him to reject the pebble out of his way, out of his life, this stone, that sin which was not an integral part of his life. Let us not forget indeed, that our sins are forgiven in Jesus Christ for any sinner who repents and does not keep guilt. We will come back to that, of course. This way of acting, from losing the surrounding life to sin to better pass above it, is par excellence the most common trap in which fall many sincere people before God. In this way they seek to be agreeable to him, as well as to their companions and their whole Christian environment in general. For almost all of the questioning of my first three years of Christian life, I had unfortunately fallen myself into this trap, not escaping at the majority. I had been, however, very reserved about the amount of "earth", of life to be separated in order to make my pebbles disappear, my sins and be able to overcome them. It was a circumstance that God allowed me to do in my life, but which Satan used from the first temptations. Thunderstorm after thunderstorm, my life was rapidly furrowed, and all the rules, the philosophies, and the precepts that I had sincerely adopted at that time did not change anything. I then began to fight against myself, against my sins, trying to respect at best these rules which I saw at least for the vast majority, in accordance with the Word of God. It was however impossible for me to follow them with my heart, and not to strike my feet in my sin if I remained true with myself, therefore without hypocrisy of heart. The more months passed and the more I had to fight; The more difficult the path seemed to me again and more and more, I began to interpret the Word of God to the advantage of my opinions and sometimes even of sin. We shall not yet extend ourselves to each of the details set forth in the first part, since our present subject remains in the generality of the relations between the Holy Spirit and ourselves. I did still at the time, as I know many do, and I compelled my soul, encouraged in this by certain preaching more condemnatory of the sinner than of sin. These words had led me to accept certain good precepts as a thing accomplished in me, whereas I had only given reason them religiously, that is, in my carnal psychology. If we have approached this subject of religiosity in conjunction with what the Holy Spirit wants to bring us, it is in order to make a clear distinction between what Jesus wants to do in our lives and what men often do with it. On the one hand, we for ourselves and it is on this point that we must focus individually, but also sometimes some of our spiritual leaders for us. I will not say that it is bad for a leader to be a good example for those around him, but if it is so that his flocks resemble him or adopt the same attitudes, there is danger and can be danger of death. If, on the pretext of the unity of the spirit there is uniformity of actions or behaviors, caution danger. Just as in an orchestra all instruments play together the same tune, they do not all produce the same sound. We must absolutely do the same, and not accept to lose our identity by becoming more or less copies of some of our leaders. Imagine a violin trying look like a saxophone, and brag about taking out a sound resembling it. This is what we do in front of God if we act by adopting rules that we see good in the other, but in a heart not renewed by the Holy Spirit. We conceal our sin behind certain misleading attitudes, for even if we see them in accordance with the Word of God, that does not mean that they are the result of our attitude of heart in our own lives. If so, we live a good external attitude with a shared heart: Do we not live there a true permanent lie? We all know that Jesus said of Satan that he is the father of falsehood, for truth is not in him (see John 8-44) and his first lie is to make believe that he does not exist. The second is to make us confuse this sin with ourselves, because of the part of our soul that remained in this dimension. The third is to make us believe in the necessity of retiring the life corresponding to sin to cover it, because we have no longer access to it, preserving it forever in our soul. We will keep in mind this way of cultivating our soul as that of the wide door which leads only to mediocrity, but never to the benefit of life that God wants to give us in abundance. He who has done so will perhaps have made it him, feeling himself condemned by his evil deeds, and will have been too ashamed to confess and repent in front of God, sincerely seeking not to reproduce it again in front of men who would have condemned him. Perhaps ??? Perhaps also, at times, he would not have had the real intention of losing this error altogether, since life would seem him impossible without this "tolerance," and he would only have hidden it to the view of other Christians, to be able to continue walking with them, the rest of the rules suiting to him. Our soul has become, the earth which has received the good and perfect seed of the Holy Spirit, do not cultivate it according to the ancestral methods of Cain, bringing it as a justification of our good conduct before God! (Genesis 4-2/8) And she further bore his brother Abel. And Abel was a shepherd, but Cain was a husbandman. And in process of time it came to pass that Cain brought of the fruit of the ground an offering to Jehovah. And Abel, he also brought of the firstlings of his flock, and of their fat. And Jehovah looked upon Abel, and on his offering; and upon Cain, and on his offering, he did not look. And Cain was very angry, and his countenance fell. And Jehovah said to Cain, Why art thou angry, and why is thy countenance fallen? If thou doest well, will not [thy countenance] look up [with confidence]? and if thou doest not well, sin lieth at the door; and unto thee [shall be] his desire, and thou shalt rule over him. It is not by chance that God left us from the beginning of Genesis this example of Cain and Abel, for the one who cultivates his soul as we have just seen will always remain the one who will turn out at the other, the word which God addresses to him, until to lapidate him at least of the tongue. God certainly wants us to dominate our sin, it is obvious, but not by ourselves, he knows that it is impossible for us. He simply expects our agreement to let the one who has already defeated it do it: JESUS. He knows, indeed, what is the end of him who, as sincere as he may be, wishes to resist at sin by his own strength, to cultivate his "land" by himself, even if it had been taught of the Holy Spirit. Had not Cain been taught of God Himself? I will say even more, whoever has been taught of his evil deeds by the Holy Spirit, will be even more held accountable before God for mismanagement of the situation. Why that? Because the Holy Spirit is not only there to make aware to him of his mistakes, so that he buries them, He is especially there to lead the person concerned on the path of truth. He will do it in various ways, and that is there the wonderful thing to discover the miracles that God has developed to bring us to the understanding of our bad referrals. That is why the Lord gave Him to us and not so that we appear in the eyes of others as supermen without sin, while they are only better concealed from their gaze, having only been ourselves better informed of them in more precise situations. What makes freedom is therefore not sincerity, but truth. It is quite evident that the Lord speaks here of the "true" truth, that of God, but when we can be compared by the Holy Spirit, in order to realize whether "Our" truth is truly that of God? When we will be TRUE, OURSELVES !!! Only then! At that time ONLY, the Holy Spirit will be able to show us our difference of behavior, compared to that of Jesus; our difference in motivation and the Holy motivation of God. Let us then expect to him, because he will not delay if we agree to do His will, while remaining true. He will not reveal our sin to accuse us, but to bless us, so that we may be freed from it. Does this mean that we must continue to sin for the Lord to reveal it to us? Especially not, quite the contrary, because we must want to no longer sin but to recognize ourselves as we are, without pride, in the humility of our human condition. We will neither do introspection to detect a fault in our life that could trap us, but only expect for God, knowing that if we sin again in the same field, we will ask for forgiveness, and again forgiveness, without ever capitulate to cover sin, desiring as much it is possible to us not leave room for this one. When we will be at this point, we will have just begun to become aware of a certain gap between our truth and that of God, a “dephasing” between our heart and that of God. We will already feel the beginnings of the revelation of our error, the source of it. Will we then endeavor to protect ourselves by some subterfuge? Will we withdraw the part of life that goes with this part of error, for fear of being recognized by others as living in sin? ESPECIALLY NOT! How much the Temple of the Holy Spirit that we are ourselves, worth more than a simple tower? How much more must we then take the time to measure all the visible consequences that this imposes for us! Precipitation and temerity are never good counselors. It is true that from this moment we will generally begin to realize that forgiveness will undoubtedly be necessary, as we shall discuss in the next chapter. If we have created a wrong in others, we will shoulder ask for forgiveness, even repair them if we can, and at least ask the Lord for forgiveness, since all sin is committed first against God. Satan is well aware of this, considering that it is in order to cut us off from God that he himself incites us to do so. This is however where sincerity and honesty before God intervene to remain true despite what will cost us, and as I have myself heard the advice of the excellent message of a Cameroonian pastor: Lord, You see my evil heart, I cannot aspire to lose all this, you know that I am perfectly incapable of it by myself. "Lord, I am willing to believe that you can make me capable of it, but I pray you, come to my rescue, give me both" desire " and " doing ". Desire, because I understand that it is your word, and in spite of all my efforts, I cannot aspire to it completely; and the "doing" because I know I will not have the strength alone. (Philippians 2:13) tells us about this: For it is God which worked in you both to will and to do of his good pleasure.// Let us therefore rely on Him, but also ask Him for a sincere heart. Our prayer will then be the engine of a miracle of which we will soon be spectators. In this expectation we will be able to sleep quietly on your two ears, for Jesus ALWAYS grants this kind of prayers and miracles. It will not necessarily be immediate, but let's expect to him. In this expectation we do not worry since we asked him, but remain especially in the truth of ourselves, as we are. Let us simply seek to preserve communion with God, the heart always repentant if we reproduce the same fault. One day, often at the most unexpected moment, we shall see ourselves just at the point to act in our habit in such a situation, and we shall understand miraculously what prompted us to do so. We shall then say: Ah! No ! Lord! And we will have the strength not to act. Jesus overcame the TEMPTATION, it is His Spirit in us that will overcome ours. Will the work in us be finished? Sometimes yes, sometimes not, but we'll come back at this "something" that bears a name and prompted us to act in a bad way. The Holy Spirit is not the one who wants to show us our sin in order to accuse us of it, but on the contrary in order to show us the path of ease in following Jesus without committing sin. Remember this path in a virgin forest that we had taken as an example in the first chapter. It is much simpler to follow Him, rather than to make another one next to it. Does not the labyrinth of our souls resemble a virgin forest? What have we to fear to be guided by the Holy Spirit, did not God love us so much, up to give for us his own son? He did it for our happiness as a sacrifice for our sins at the Cross of Golgotha where Jesus then said, "Father forgive them," but also, "IT IS FINISHED! " What more are we waiting? Sin in the form of Camembert on the way to our lives, with the work of the hoe. Life scratched in the vicinity of sin, giving way to mortification with more or less an appearance of piety. Life accumulated to overcome sin, after the work of the hoe.